Labrador temperament is often described in very positive terms. 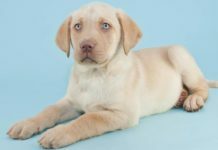 Many people have preconceived ideas about what their Labrador puppy’s temperament will be like when he or she is grown up. In this article we’re going to delve into the topic of dog temperament. In particular we’ll look at Labrador temperament. To do this we’ll look at some of the latest studies and findings. There has been quite a bit of research published on dog temperament in the last couple of decades. As a result our knowledge and understanding of temperament in Labradors and other dogs has grown. Improvements in the accuracy and relevance of tests for evaluating temperament in adult or nearly adult dogs are important. This is especially the case in Labradors and other working dogs. Some studies have been carried out on guide dogs. Their findings are often relevant to Labradors because most guide dogs are either Labradors or Labrador mixes. Studies on guide dogs have come up with useful results. For example, they’ve shown that temperament assessments carried out on dogs at a year old can be reliable predictors of the dog’s ability to respond to training and work. Studies show that there are measurable differences in personality traits between different groups of dogs. One aspect of canine temperament or personality that has the most serious impact on people, is aggression. In 2016 The Independent, a UK newspaper, ran a story in which they revealed the shock news that the Labrador was the dog ‘most likely to bite’ in the UK. Unfortunately, this article was confusing readers by taking information from a report about personal injury claims and the dogs causing them. It’s more accurate to investigate the proportion of dogs of any breed that actually bit someone. Essentially, the dogs blamed for biting, were dogs that happened to be popular. The fact of course, is that a proportion of all dogs will bite. 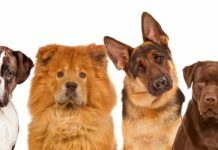 The more popular a dog breed is, the more dog bites will be reported for that breed. That does not mean that individuals of that breed have an increased chance of biting someone. Many people are campaigning to stop dog breeds being labelled as ‘biters’ or ‘dangerous’. They are encouraging aggression to be regarded specifically as a ‘man made’ issue, caused by poor socialization. Like so many issues however, this one is not straightforward. Studies have shown that distinctive differences in dog temperament do exist between different breeds. A 2008 study showed that Dachshunds, Chihuahuas and Jack Russell Terriers were more likely to show aggression towards both strangers and their owners. Australian Cattle Dogs were more likely to show aggression to strangers. American Cocker Spaniels and Beagles were the most likely to show aggression towards their own owners. The effects of aggression will depend on the size and biting style of the dog. This is why dog bite studies show that some breeds of dog are more likely to kill or cause serious injury than others. Don’t have nightmares by the way, the National Safety Council estimates that your risk of being bitten by a dog is still less than 1 in 100,000. And by choosing your dog carefully and socializing him thoroughly as a puppy, you can reduce this risk further. 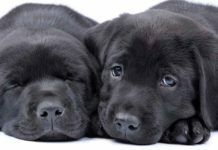 What is Labrador temperament like? Despite the Independent’s scary article, that 2008 study I mentioned above also showed that Labradors were among the least aggressive dog breeds. This includes aggression toward both humans and other dogs. So you can rest easy on that score. Now here are some of the other frequent assumptions made about Labrador temperament. Let’s find out if they are true! On the whole this statement is true. Most Labradors are confident, outgoing friendly dogs. Happy to talk to strangers, and to welcome guests into your home. It’s also important to be aware that some Labradors can be fearful or nervous. There are ways to minimize the risk of your Labrador turning out this way. We’ll look at that in more detail below when we talk about how Labs get their temperament. Kindness is another of those traits that is difficult to quantify. All we have to go on is anecdotal evidence. Labs tend to be very affectionate. There are many reports of Labradors showing great kindness and empathy when their humans are sad. It is pretty hard to provoke or annoy most Labs. They are tolerant of all kinds of behavior that they probably don’t particularly enjoy. Being hugged and climbed on by small children for example. This doesn’t mean that you should allow anyone to annoy or provoke your dog, but it does make him a much safer animal to have around should an accident occur. Some experts like to look at intelligence separately from temperament. But Labrador intelligence is legendary. Many Labrador owners will consider this part and parcel of their dog’s Labrador personality. Intelligence may vary from one dog to another within a breed, and can be difficult to define. The Labrador breed as a whole is generally considered to be highly intelligent. It’s hard to separate intelligence from trainability. The ability to learn and willingness to learn are hard to tease apart. A 2011 study looked at trainability differences between different groups of dogs. The Labrador belongs to the sporting group. The study found that the dogs in this group were more trainable than non-sporting dogs. Hmm. This assumption is subject to some provisos. It is certainly true of many mature Labradors. But it isn’t something you should rely on. And it isn’t a personality trait found in many young Labs. On the contrary, Labradors under a year old can be extremely boisterous and clumsy. They can actually pose a small risk to anyone unsteady on their feet. I’m thinking of toddlers just learning to walk, and elderly people whose balance isn’t great. You may want to opt for an older dog if you’re worried about vulnerable people getting hurt. People often make assumptions about Labrador temperament based on their color. Let’s have a look at that next. You’ll often hear people say that Chocolate Labs are dumb or hard to train. In the same way, Black Labs tend to be favored by the hunting or shooting communities. They may be considered by some to be smarter because of this. The fact is, that Labrador coat color does not directly affect the personality traits of individual dogs. However, the genetic information a dog inherits from his parents most certainly does. A study published in 2015 showed that dogs bred from working lines were more trainable than dogs bred from show lines. This is not particularly surprising bearing in mind that working line (or American type) Labradors have been selectively bred for this characteristic. The Labrador breed is not immune from temperament problems. Aggressive or reactive Labradors can and do exist. This can be a bigger problem than aggression in other breeds. 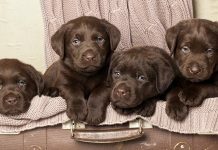 This is mainly because people tend to approach strange Labradors in the expectation that a Labrador will be friendly and pleased to meet them. 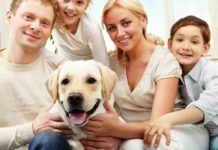 If your Labrador is more aggressive or reactive than you are comfortable with, this article is for you. Owning a grumpy Labrador is not fun. 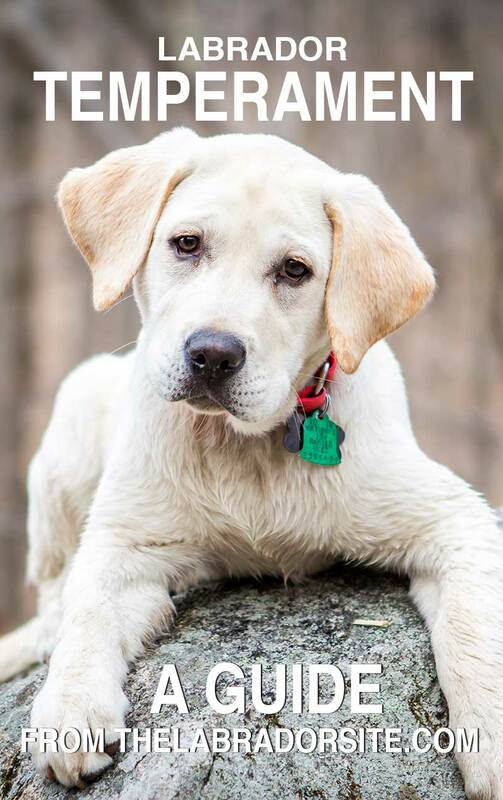 So how do you make sure your Labrador puppy will have a good temperament? The influence of the puppy’s environment. 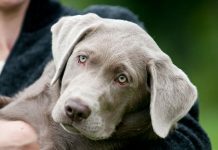 The foundations of a puppy’s temperament are inherited from his parents, but the way he is raised can have quite an impact. Your first step to success though is dependent on your choice of breeder and on the parents of your puppy. A puppy that has been bred with care will have two parents with excellent temperament. This gives you the best chance of raising a good natured dog. Do your utmost to see both parents when you are choosing a puppy. And be absolutely determined to walk away if the parents are not friendly and welcoming. I cannot stress how important this is. Mum should come happily out to greet you, tail wagging furiously. That’s the bottom line. If you cannot see Dad, make sure you get a reference from someone that has met him. The temperament of the parents may give you some idea as to the potential temperament of the puppy. However, a part of his final temperament is dependent on correct socialization. Effective puppy socialization is the other essential ingredient to good temperament. Much dog aggression is linked to ‘fear’ or feeling threatened. The more thoroughly and effectively you socialize your dog, the more confident and fearless he will be. Fearless dogs are normally friendly dogs. Fearful dogs are more likely to become aggressive. ‘Guarding’ instincts (which many labs do not have at all) are often based in ‘fear’ and are likely to be diminished through socialization. Dogs with a guarding instinct will attempt to protect their home/property against what they consider to be a threat. The better a dog is socialized, the less things he will find threatening. A very well socialized dog will feel threatened by very little and is more likely to invite a burglar in and offer him the key to the safe, than to chase him away. People often expect quite a lot from their dogs. Many people want a dog that is both friendly and good natured, especially around children. But they also want a dog that will guard their home. Or at the very least, bark at intruders. 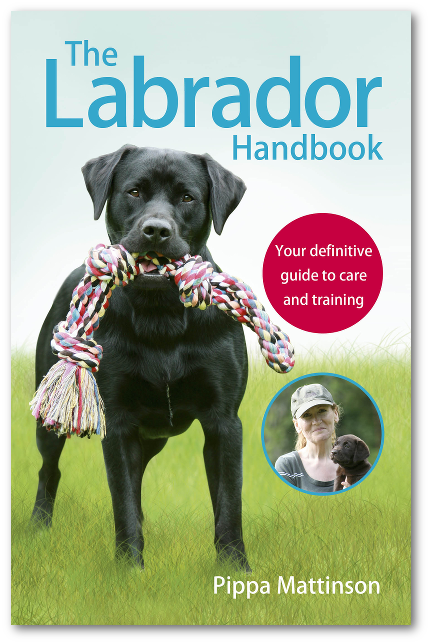 Strange as it may sound, I actually receive a lot of correspondence from people overseas, asking me to tell them how to teach their Labrador to bark! People want to know how they can stop their dog being so friendly! Asking for a dog to be both great around kids and to keep intruders at bay is actually quite a tall order. That is not to say that a dog can’t do both, some can. But not all. And there are serious risks in increasing guarding instincts deliberately. This is especially true when bringing a large dog into a family where there are small children. Your ‘guarding’ dog may be nice enough to family members under normal circumstance, but you have the rest of the world to consider. Once you have your own children, other people’s children soon come into the equation. And a dog with guarding instincts can be a real worry and a problem when you have frequent child visitors. My personal feeling is that it is not appropriate to expect a Labrador to be a guard dog. 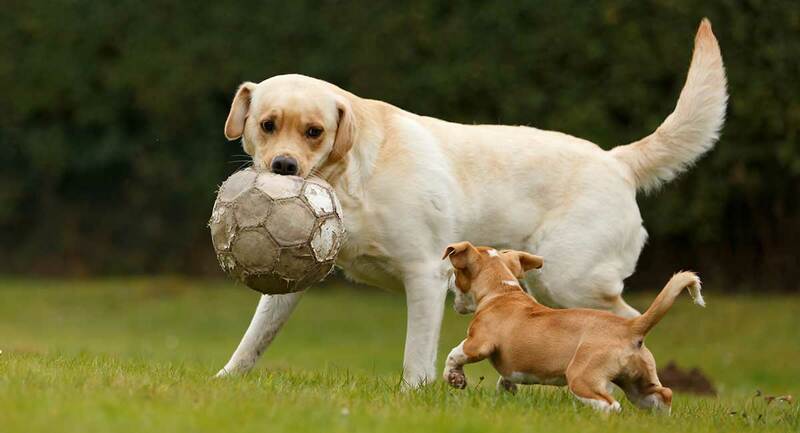 Most Labradors have minimal guarding instincts. And I certainly don’t teach people how to make their Labradors less friendly. Accept your lovable, greedy, friendly, bouncy lab for what he is. Socialize him well and be grateful you shouldn’t have to worry about him biting the mailman. Let him be a Labrador. There really is nothing nicer. Does your Lab play nice? Let us know in the comments. This article has been revised in 2019. Katy D. Taylor, Daniel S. Mills, The development and assessment of temperament tests for adult companion dogs. Journal of Veterinary Behaviour 2006. Deborah L. Duffy, James A. Serpell. Predictive validity of a method for evaluating temperament in young guide and service dogs. Applied Animal Behaviour Science 2012. I have a yellow English lab that is 6 1/2 months old. The first 2 months with her were absolutely brutal! She bit us mercilessly. She has gone through puppy class, and we even took her to a dog behaviorist. She is quite an anxious puppy. She hates the car, getting her harness on is a challenge as well. She is overexcited in almost every situation.She complained and barked during all the puppy classes. She gets very bored and distracted during training. Now the good news! She is very smart, and she loves everyone and plays nice with other dogs. The behaviorist says she’s a nice puppy with a sweet personality. We love her very much, but boy has she been a challenge to live with. She also steals and jumps on people. She demands a lot of attention and excersize. We have been very dedicated to her training and educating ourselves about current positive training methods. Please tell me this gets better!!! Someone dumped two young female labs in the country area where we live, one grown yellow, and a six to seven month old chocolate. Both were coming into season, and neither had any socialization or training. The yellow was fearful and showed aggression, while the chocolate was just cowed, both I would say from abuse and because the older of the two was supper dominate toward her. I fed and watered both of them, and finally was able to get hands on both. The yellow was mouthy and food aggressive, and the chocolate was just needy for affection. We had to leave the house for a few hours the next day, and wen we returned both were gone. That evening the chocolate returned and took up residence. She has come out of her shell, is loving, confident, and is Velcroed to both my wife and I. I have to tie her if we leave or she will follow the car or truck, but if she knows either of us is in the house she will stay at home. She would love to be a lap dog, and the only problem I have with her personality since she has learned to trust humans is that she will go to or with anyone, and won’t even bark at strangers. We have always, until the last couple of years had guard dogs, but this will never be anything but a lover, even of a burglar, but is super good with kids. This is the first lab we have ever had, and while sweet and lovable and good company, will never be a dog that is loyal to the point of protecting anything or anybody. Despite that, she will have a home for life here. I rescued a black lab from a neighbor who kept her chained outside in the cold.i asked her if i could buy her but she just gave her up. Shes just a year old and shes jumping on everybody and tearing things up. Will she grow out of this? I give her pets and talk to her all the time…. I have a 3 1/2 years old Chocolate Lab. We rescue her when she was like 6 months old. On her there were sings like she was abuse, she was scared from cars, belts, she didn’t want to go on walks and didn’t want to go close to any member of the family. Finally she started to go closer to us, but there’s no way she is going to be friendly with strangers, worst with those that show fear at her. If a stranger doesn’t pay attention to her, she probably will start jumping on them asking for them to pet her. It is painful see her be like that because I have to find places where nobody is around to walk her , because I’m afraid she can hurt someone. And we also have a Yellow Lab, that he is the sweetest thing on the world. What we can do to help her and be more social. Hi Sharon, Puppy aggression is nearly always not aggression at all. Here is more information for you . How to recognise and treat puppy aggression . I have a 1 1/2 old lab. He is a great dog. Only problem is he is aggressive towards other dogs. I cant take him to the dog park. If we walk and there is another dog he tries to get away from me and growls and barks at the other dog. Don’t know what to do. We have a female chocolate lab, her name is pebbles. She is wonderful with kids. We have two kids (11 and 7 year old). She is also very nice with almost everybody. There are a few people who she doesn’t like and gets very aggressive. Even her hair sticks out, usually people with dark skin and police man. I am not sure what the deal is. She has been with us since she was a puppy (6 years). There hasn’t been any traumatic situations for her to act like that. She doesn’t like to be around other dogs that much either. I guess she likes to be in control of her territory and when they start jumping at her or invading her space when she is resting she kind of growls at then and leaves. My daughter can do anything to her and she won’t even move but other dogs are not welcome. As far as I know that is not a characteristic of Labradors. I am not sure what is making her act like that. My dog Monty is a lab crossed with a golden retriever. He is two and a half years old. He is big even for his breed. He has always greeted people with a wagging tail and a bit of a slobber but never a bark. We never intended him to be a guard dog because we do not want him to be put at risk. However at night ( he sleeps inside.. in our bedroom) when he hears a noise or sound he is not familiar with he is up and about, vigilant and will bark if necessary – very loudly. He seemed to develop his sense of protection without any influence from us. He is a gentle “giant” and we just love him….never an off day as far he is concerned. My sister has a beautiful female Chocolate and she is so friendly and smart. However she must get to know you before she becomes friendly to you. She will even bark at me when I knock at the door until she recognizes me. I have a gorgeous 8mnth old black labrador. He is so friendly never barks. Loves running, all the labrador stuff. I would never have any other breed. He makes me smile and everybody loves him. We let him be a puppy labrador. He is going to turn into a very handsome dog. I love him to bits. We have had 6 Labs, all have been exceptional with our children and other peoples children plus exceptional guard dogs. On saying that we work from home and have a good walking routine, we also spoil them rotten and they are not ‘pets’ they are a part of the family unit. Like anything in life you get out what you put in. We have also ‘rescued’ 5 older ‘troubled’ dogs. They were not ‘troubled’ or ‘aggressive’ or ‘shy’ they were in the wrong environment. Of course some dogs have problems, but often it is not that complicated. Give older rescues a chance, they are so rewarding and so wonderful, plus they don’t eat shoes! I recently brought a black Lab pup, 35 days old, and have no idea what to feed him. i have been feeding him diluted cows milk, chicken egg and mashed bread…is it advisable that i continue this? I have an 8 month old chocolate lab. He gets super intense when we plays fetch and will bark and bark until I throw the ball. Is there anything I can do to discourage that behavior? hi, I have a 2 year old black lab. He is a good dog, but lately he has been super over procted of me. I take him for walks, he also soscialized with some humans. But when he sees some people , he will bark at them and snap at them too. He has done it to people I know , but he never met them. He is glued to me. Whenever I walk around the house he right their. I don’t mind that but what I would like to know how can I teach him that some people that I know is he should like them. he just did this recent. He likes some people but other people he don’t trust. Hi, I have recently bought a golden labrador puppy, 8weeks old. She has settled into her new home really well. She does mouth hands and feet but we are slowly teaching her alternatives by using her toys and rewards for good behaviour. She is full of it and loves to bounce around and play. She sleeps well in her bed in the kitchen all night, no crying and is now slowly toilet training in the garden we have at home which is progress from the accidents in the house. We have two children and she seems to realise that my youngest of 7months is a baby and that she has to be careful when I let them interact under supervision. My three and half year old is a little frightened as she is boistorous sometimes and nips at his hands and feet but we are steadily working on that so that he knows how to manage her and remain calm as she sees his running about as a game, and that she alse realises that at times she is too much and needs to be calm. However I took her to meet the vet today and have her first jabs. We waited 50mins in the waiting room so she was a little stressed. We then went in to see the vet. She did not greet my puppy but sat opposite spoke to me and then approached molly, tilted her head back and began an eye, mouth and ear examination. my puppy went hysterical, trying to wriggle away, screeching with her mouth wide open but not growling or bearing teeth and gums exposed. She seemed very stressed and frightened. The more the vet tried the worse it got. She therefore refused to inject her and said she was neurotic and aggressive. I was very upset for my puppy as she responds well at home, no aggression and if told ‘no’ sternly for misbehaving seems to accept this very well. The vet asked me to examine her which I did and she let me look in her mouth, ears etc no problem. Can somebody please advise me as I feel my pup has been traumatised, and is this a sign of aggression. I have contacted the breeder from whom I purchased her and she agrees that it was fright. Her mother and father are lovely relaxed dogs as I have seen, and she seems well adjusted. I am just so concrened! It sounds as though your puppy panicked. Don’t worry, it is unlikely that any permanent harm has been done, but is perhaps an indicator that this puppy need more handling to get her used to being examined, and lots of socialisation. All puppies need to get used to being happy to let anyone feel them all over. In the meantime I would also find a vet that does not keep you waiting nearly an hour for an appointment! I would be annoyed if my vet kept me waiting more than ten minutes. There is almost always a choice of several vet practices in any town. It is a competitive business these days and if you are not happy with one vet, try another. Hi, I have a beautiful labrador ( I expect we all say that don’t we). She is three and a half. She has a wonderful temperament, is very gentle but seems also to be a guard dog barking whenever he doorbell rings. I try and calm her by gently telling her all is well and stroking her but she seems very agitated all the time and still barks. I do let her see the people at the door (after explaining that she’s ok and will stop barking in a minute) if they are ok with that she seems to settle after I talk to them for a while she seems to realise that they are no a threat. I walk her on our local common which is a huge area of army land and if there is someone walking on their own, runners and cyclists without dogs she will run up to them barking until I can get hold of her. Obviiously this frightens them and I do try and anticipate the situation and I put her on the lead before she can act. Once on the lead she’s as good as gold and there is no sign of her angitation, barking or anything. If they have a dog with them then she will go up to the dog and the usual greetings take place and she is fine. I just don’t know how to stop her reacting like this, I don’t mind the barking but would like to be able to reassure her that all is well and I’m in control of the situation and she has nothing to worry about. I am not sure if you can help me with ths problem but if not perhaps you can point me in the right direction, perhaps I need one to one help with her. I live in Liss in Hampshire.